The following conditions apply to and are deemed to be incorporated in all contracts for the sale and supply of Signs 'R' Us Ltd services and materials. Unless otherwise stated a quotation is open for acceptance for a period not exceeding 30 days from the date of supply. Thereafter the price may be subject to alteration. With reasonable cause the client may cancel orders. Upon cancellation the Client will be immediately liable to pay any or all costs or expenses incurred by us in the performance of the order, such costs and expenses to be determined solely by Signs 'R' Us Ltd.
Any goods rejected as not complying for any reason with the order placed must be rejected within 7 days of receipt of the goods. In the case of a complaint all goods must be inspected by Signs 'R' Us Ltd, or returned to Signs 'R' Us Ltd before any claim can be considered. Where goods are damaged or lost in the custody of a carrier, Signs 'R' Us Ltd will, at its sole option replace the goods or refund the Client the cost of the goods. In no circumstances will Signs 'R' Us Ltd liability exceed the cost of replacement of the same. In the event of stripping graphics from the clients vehicle, Signs 'R' US Ltd will take upmost care not to damage the existing paintwork, however should damage occur from paint lifting, Signs 'R' Us Ltd will not accept any liability. When Clients order clothing from Signs 'R' Us Ltd catalogues, they must check the sizing of the items. Signs 'R' Us Ltd will not be liable if the clothing ordered is the wrong size. In this event the Client will have to pay for the items ordered and replacements if required. Signs 'R' Us Ltd retains title to the goods until they are paid for. Signs 'R' Us Ltd may enter the Clients premises and recover the goods which are its property by virtue of this clause. If you do NOT have a credit account with Signs 'R' Us Ltd, payment is required with collection/supply of the goods. For Clients with credit accounts payment for the goods shall be made within 30 days of the date upon which the goods are invoiced by Signs 'R' Us Ltd, unless terms are otherwise agreed. Under the Late Payment of Commercial Debt Regulations 2002, Interest & Compensation will be charged on all invoices outside our Trading Terms. 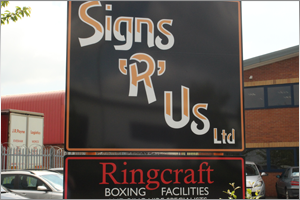 When Clients supply Signs ‘R’ Us Ltd with artwork using Generic File Types such as EPS or PDF, Clients must ensure that all fonts are created to Outlines/Curves. This helps to guarantee accurate reproduction. Whilst Signs ‘R’ Us Ltd will do our upmost to check that files have imported correctly into our system, we will not be held responsible for errors relating to File conversion if Fonts have not been converted correctly. In such an event the Clients will be held responsible for all costs. When UV over laminate is applied to any print work this may create a minor adjustment to colour due to the UV properties of said laminate. Signs ‘R’ Us Ltd accept no responsibility for any colour difference from original on screen artwork. All Copyright of Designs created by Signs 'R' Us Ltd shall remain the property of Signs 'R' Us Ltd. All artwork supplied or produced by Signs 'R' Us Ltd (whether or not such design is accepted by the Client) shall belong to Signs 'R' Us Ltd and the Client shall not without licence in writing from Signs 'R' Us Ltd make or license any copies of such design. All artwork supplied in complete confidence and is protected under the 1988 Copyright Act.